Bouchér Photography: Boucher Shots Featured in San Diego Style Weddings Magazine's "Real Weddings" Article! 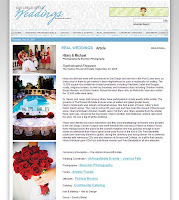 Boucher Shots Featured in San Diego Style Weddings Magazine's "Real Weddings" Article! "Hilary and Michael were both born/raised in San Diego and now live in the Point Loma area, so it was nice for them to get married in their neighborhood in such a historically rich setting. The 15,000 square–foot estate has hosted presidents, including President Carter and Reagan, royalty, religious leaders, as well as Broadway and Hollywood stars including Charlton Heston, Sergio Mendes and Diane Keaton. Robert Mondavi, Baron Eric de Rothchild, have also visited the 12,000 bottle wine cellar.Dr. Seuss and Jonas Salk among others have participated in charity events at the estate. The grounds of The Rosecroft Estate include acres of walled and gated garden luxury." Boucher logo and photos featured on Collages.net!